(Bottom) Illustration showing a schematic of a computer chip with a hotspot; (middle) an electron microscope image of defect-free BAs; and (top) an image of electron diffraction patterns in BAs. Courtesy of Yongjie Hu, University of California Los Angeles. Scanning electron microscopy image of CVT-grown BAs crystal. Courtesy of Bing Lv, University of Texas at Dallas, and David Cahill, University of Illinois at Urbana-Champaign. Laptops, cell phones, and other electronic items generate heat during use, which can reach critical levels, slowing down operation or leading to complete failure. Large data centers, for example, have to expend a significant portion of energy usage on effective cooling systems. Managing unwanted heat is now a bottleneck in the development of smaller and more powerful electronic systems and new materials that can conduct and dissipate heat more effectively are urgently needed. 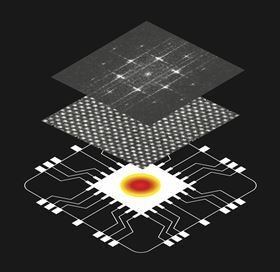 In three separate reports published in Science, researchers have confirmed a theoretical prediction made some five years ago that the semiconductor boron arsenide (BAs) should have an unusually high thermal conductivity, which could help keep the next generation of electronic and optoelectronic devices cooler. Researchers from the University of Texas at Dallas, University of Illinois at Urbana-Champaign, and University of Houston measured thermal conductivity levels of 1000 ± 90W/m/K at room temperature in millimeter-scale BAs crystals using a technique called time-domain thermoreflectance (TDTR) [Li et al., Science (2018), DOI: https://doi.org/10.1126/science.aat8982]. Using the same technique, Yongjie Hu’s team at the University of California, Los Angeles report a room temperature thermal conductivity of 1300W/m/K in their single crystals of BAs [Kang et al., Science (2018), https://doi.org/10.1126/science.aat5522]. Zhifeng Ren at the University of Houston and colleagues at Massachusetts Institute of Technology, The University of Texas at Austin, Boston College, University of Illinois at Urbana-Champaign, and Lawrence Berkeley National Laboratory also observed similar thermal conductivity values in BAs exceeding 1000W/m/K with an average bulk value of 900W/m/K [Tian et al., Science (2018), https:// doi.org/10.1126/science.aat7932]. These recorded levels of thermal conductivity in BAs are around three times greater than silicon carbide, which is currently used as a heat dissipating material. Although diamond is the ultimate thermal conductor (with a thermal conductivity exceeding 2000W/m/K), and can be used for heat dissipation in very demanding applications, it is expensive and difficult to produce over large areas. BAs could offer a much-needed alternative for heat dissipation in future electronic devices. The key to realizing the high levels of near-predicted levels of thermal conductivity in BAs is the growth of defect-free crystals. 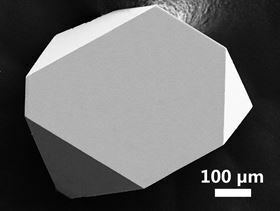 All three teams used a modified chemical vapor transport (CVT) technique to produce high-quality single crystals of BAs largely free of grain boundaries and defects. Like other heat-conducting crystalline materials, BAs dissipates heat through vibrations in its atomic lattice. The vibrations can be described as phonons – or packets of energy – analogous to quasiparticles carrying heat through the crystal lattice. But any defects or impurities in the lattice will interrupt the heat flow and reduce a material’s thermal conductivity. It is not entirely clear why BAs has such a high thermal conductivity. One suggestion is that the large mass difference between B and As atoms limits the number of ways in which phonons can interact with each other. Weaker photon interactions in a material, typically equates to higher thermal conductivity. The unique band structure of BAs, meanwhile, also allows very long phonon mean free paths. “Our study verifies that defect-free BAs has very strong highorder anharmonicity through the 4-phonon scattering process, which has been ignored by theorists for decades but strongly affect the thermal conductivity of BAs,” adds Hu. What all the researchers are certain of is that the future is bright for BAs as a thermal conductor to dissipate unwanted heat and enable better performance from electronic and optoelectronic devices. Lv says the next step will be to improve the yield of BAs crystals with high thermal conductivity through a better understanding of the role and control of defects. New techniques for the large-scale production of these materials may need to be developed. Hu and his team at UCLA are already producing BAs samples of around 10 mm, and are now aiming for wafer-sized samples. Ren and his team are working towards a similar aim. This article was originally published in Nano Today 22 (2018) 2–4. Scientists have calculated that, unlike most materials, when boron arsenide is compressed its heat conductivity first improves and then deteriorates.